Julian Barnes is a novelist I've never quite been able to get into. I've read a fair few of his books, and enjoyed some of them (Talking It Over, Flaubert's Parrot, Arthur & George), but have never felt passionately strongly about any of them. There's also been a couple I've disliked or have forgotten soon after reading them. Yet, for many, Barnes was the great hope of this year's Booker Prize shortlist. I won't go into the details here (there's plenty elsewhere on the internet if you care), but this year's Booker long- & shortlists disappointed many because of the dominance of unremarkable novels and a general sense that the chosen novels were far from being representative of the best fiction published by Commonwealth authors in the last year. I've not read enough of them to really weigh in on that question - although that's in part because a lot of the shortlist, let alone the longlist, had no appeal to me, which may add some credence to that school of thought - but it was certainly a common reaction. 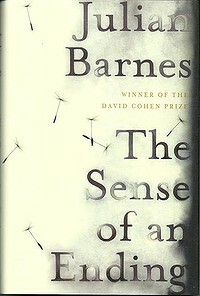 Against all this, one author & their book were received near-universally well, so the sorts of people who care about these sorts of things hoped that Barnes' The Sense of an Ending would take the prize this year. And, indeed, it did. All that background aside, The Sense of an Ending in any year would make a worthy contender for the Booker Prize. I say that for two reasons: first, it is a very good novel; and second, it is the sort of thing Booker panels over the last few decades have tended to reward. That latter is, perhaps, a slightly backhanded compliment, since it can be argued - not unfairly - that the Booker Prize does favour, amongst a few other things, beautifully written accounts of middle-class people taking stock of their lives. Sometimes that sort of book drives me to tears of boredom, but sometimes - as with The Sense of an Ending - it can be done effectively and made into something more than the genre trappings would suggest. Key to the success of The Sense of an Ending is the perfectly-pitched narrative voice. Tony Webster is not always perfect, but he is likeable. At one point, the older Tony realises what an awful, childish thing he did to a friend when they were at university, but Barnes conveys this convincingly - his embarrasment at realising how badly he'd reacted, his genuine surprise at learning this and his remorse for the consequences of his actions. And that scene, and its aftermath, is a good microcosm of Tony thoughout the book - honest about his failings without being self-pitying, and generally accurate in his self-assessments. And, not incidentally, often quite funny. The first section of The Sense of an Ending takes place at Tony's school, within his little group of friends, and specifically focuses on newcomer Adrian. Slightly distant from his new friends and classmates, the high school-aged Adrian demonstrates a remarkably mature & philosophical approach to life, which is often played against the adolescent pretensions of Tony and their other friends. The boys head off to (different) universities, but remain in contact for a while. However, Tony's spiteful reaction to news from Adrian ends their friendship and they fall out of touch. In the second, longer, section Tony reflects on his relationship with Adrian & also his first real girlfriend, Veronica, and in the process learns some things about each of them, including himself. In some ways it seems unfair that Barnes should have won the Booker in a year generally considered to have one of the weakest longlists in the prize's history. Yet, in years to come, people will forget that, and see The Sense of an Ending as another winner, and one which was deservedly chosen. And, for most people, who don't care about the Booker Prize one way or another, it will remain nothing more or less than a very good novel. * Almost all novels, from literary fiction to airport potboilers, sound either boring or ludicrous (or both) when their plot is described in a paragraph or less.